According to Wikipedia, the Russian author Ivan Alexandrovich Goncharov (1812-1891) claimed to have written Oblomov (1858) in just one month, but the novel had had its gestation in a short story called Oblomov’s Dream published previously in 1849. It’s an intriguing tale, absurdist in style and satiric in its intent. It is to this book and its central character that we apparently owe the words Oblomovism and Oblomovitis, which have come to mean fatalistic slothfulness. Or, to use the vernacular: ‘bone-idle’, ‘good-for-nothing’ and ‘too lazy to get out of your own way’. There is more to this anti-hero’s pathological laziness than that, however. 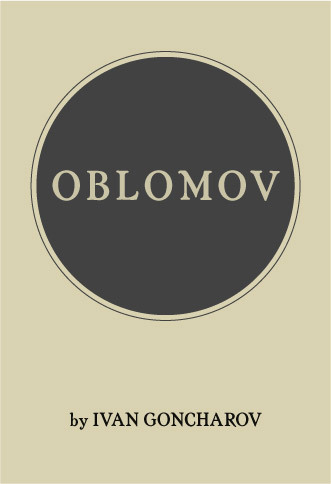 Oblomov is an example of the Russian literary concept of the ‘Superfluous Man‘, which Wikipedia says is a by-product of Nicholas I‘s reactionary reign when the best educated men would not enter the discredited government service and, lacking other options for self-realization, doomed themselves to live out their life in passivity. Pushkin’s Eugene Onegin (1825-1832) is another example of a superfluous man, and so is Tchulkaturin in Turgenev’s The Diary of a Superfluous Man (1850), both of which I have yet to read. refers to an individual, perhaps talented and capable, who does not fit into social norms. In many cases this person is born into wealth and privilege. Typical characteristics are disregard for social values, cynicism, and existential boredom. Typical behaviours are gambling, romantic intrigues, and duels. He is often unempathic and carelessly distresses others with his actions. The Superfluous Man can be seen as a nihilist or fatalist. ONE morning, in a flat in one of the great buildings in Gorokhovaia Street, the population of which was sufficient to constitute that of a provincial town, there was lying in bed a gentleman named Ilya Ilyitch Oblomov. He was a fellow of a little over thirty, of medium height, and of pleasant exterior. Unfortunately, in his dark-grey eyes there was an absence of any definite idea, and in his other features a total lack of concentration. Suddenly a thought would wander across his face with the freedom of a bird, flutter for a moment in his eyes, settle on his half-opened lips, and remain momentarily lurking in the lines of his forehead. Then it would disappear, and once more his face would glow with a radiant insouciance which extended even to his attitude and the folds of his night-robe. At other times his glance would darken as with weariness or ennui. Yet neither the one nor the other expression could altogether banish from his countenance that gentleness which was the ruling, the fundamental, characteristic, not only of his features, but also of the spirit which lay beneath them. That spirit shone in his eyes, in his smile, and in his every movement of hand and head. On glancing casually at Oblomov a cold, a superficially observant person would have said, “Evidently he is good-natured, but a simpleton”; whereas a person of greater penetration and sympathy than the first would have prolonged his glance, and then gone on his way thoughtfully, and with a smile as though he were pleased with something. On this morning Oblomov stirs himself to consider the recent arrival of a letter from his estate steward and provokes a desultory squabble with his manservant Zakhar because it appears to be missing. A couple of visitors then arrive: Volkov who (with apparent disregard for his friends long-established habits of sloth) invites the still recumbent Oblomov (in his Persian dressing gown) to a whirl of social engagements at the fashionable Ekaterinhov park; and then Sudbinski, who is ‘plunged up to his ears in good work’ and who, (in the absence of a mobile phone), is so busy that he has had to leave word where he may be found if he is urgently needed. Then there is Penkin, an author who chivvies him about his failure to read an important social critique or indeed to read or write anything at all. Oblomov has a rare flash of energy when he disputes Penkin’s argument ‘in favour of the present realistic tendency in literature’ but calms down to admit that if he does read anything it’s … travel literature. Oblomov (Kindle Locations 446-452). manybooks.net. The Oblomovs required nothing–their life flowed like a peaceful river, and all that they had to do was to sit on the bank of that river, and to observe the inevitable phenomena which, successively, and unsought, presented themselves to the eyes of each observer. Oblomov (Kindle Locations 895-897). manybooks.net. In Part 2 there is a flurry of activity: His old school friend Schtoltz arrives to ‘wean his comrade from the state of inertia in which he was plunged’ and although he fails to get Oblomov to join his travels, he gets him out of the house (sans dressing-gown!) where he meets a young lady called Olga. Next Tarantiev removes his furniture to the new lodgings, so Oblomov has occasion to dine out, and lo! there is a fully furnished villa to let across the road and there is Olga nearby! She loves this decisive new Oblomov too and for a page or two the reader’s heart beats with hope for our hero, but alas he is soon beset by doubts and regrets and decides that Olga would be better off without him. It is Goncharov’s achievement that the reader does not want to agree. For all his indolence Oblomov has wormed his way into the reader’s affection, and our suspicions are aroused at the return of Tarantiev demanding a large amount of money for the lease of that new flat and other expenses as well. (Oblomov of course doesn’t have it). Olga tries to persuade him that their love will last, but it seems that old habits die hard and Oblomov starts to panic about the preparations for marriage and the energy levels of his would-be bride. Russians of the period would have recognised the waste of talent and opportunity that Oblomov represents, and perhaps they rejoiced in the inevitable conclusion. I found it terribly sad. I read this novel for Richard’s Russian Reading Campaign at the bilingual Spanish/English blog Caravana de Rechuerdos. If interested, there’s a marvelous Soviet film version of this that is well worth watching. QuickFlix doesn’t have it. I wonder where I can source it from? I bought mine from Amazon, I think. Tell me, Stu, you know a bit about existentialism … do you think that Mathieu Delarue in Sartre’s Age of Reason is a modern version of Superfluous Man? Do you know of any other contemporary examples from European literature? I’m a bit intrigued by the Superfluous Man! I don’t know that one, will see if I can borrow a copy from the library. Lisa, belated thanks for reading this in conjunction with my Russian reading series. Unfortunately, I took a break in the middle of the book (Oblomov’s love affair with a woman wasn’t quite as exciting for me as his love affair with his living quarters!) and have yet to get back to it–will link to your post (and finish reading the middle part) once I do. Cheers! You’re welcome, Richard, I enjoyed reading it:) Thanks for dropping by.